She never even really planned to go into acting, but a viral rap YouTube video caught the attention of Seth Rogen and Nick Stoller, who cast her in a small part in “Neighbors 2: Sorority Rising,’’ then she got an independent film, “Dude,’’ from Olivia Milch, who would go on to co-write “Ocean’s 8,’’ and the pieces started falling into place. Her latest honor is being named among the Breakthrough Entertainers of 2018 by The Associated Press . 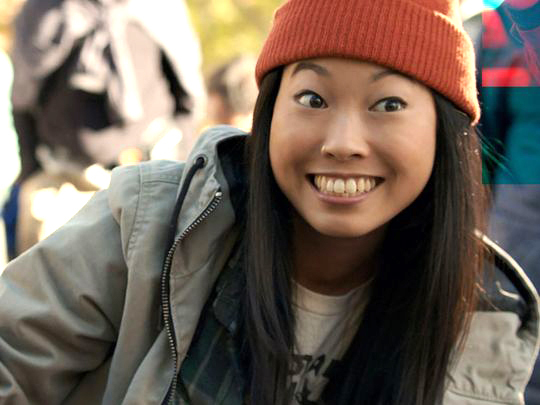 Still, it’s no doubt that Awkwafina is on the rise, with a Comedy Central show based on her life in the works, two films premiering at the Sundance Film Festival this January and, of course, the “Crazy Rich Asians’’ sequel. She’s gunning for her character, Peik Lin, to get a boyfriend and her own place. She remembers seeing comedian Margaret Cho on television when she was 7-years-old and having an “ah-ha’’ moment.